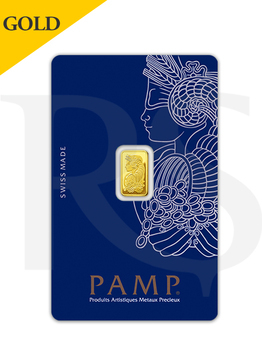 The PAMP gold bullion bars are perfect for investors who want to foray into the world of gold without spending a fortune right up front. 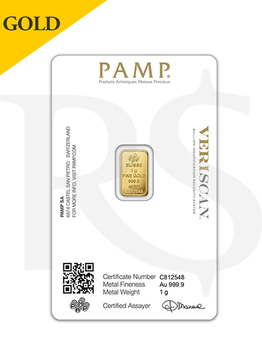 Minted by the Swiss, each bar features "The Lady Fortuna" design and is individually sealed with an Assay Card and their value gains even more security with new Veriscan® technology that helps ensure the bar's origin when buying on the secondary market. Matching serial numbers are on both the bar and the card which is signed and certified guaranteeing the quality and weight. The PAMP Suisse Lady Fortuna 1 gram Gold Bar contain 0.03215 oz of .9999 fine Gold and measures 14.7mm x 8.9mm with thickness of 0.40mm.